When I started this blog I was completely focused on writing. In fact, I could hardly wait to get started. My main reason for being so eager to get started was this: I needed to find out if I could write on a regular basis. And in English, which is not my native language – it is just about at that level where every minute example of Dutch influence nags at me. Which is annoying if you’re trying to get to a point where you actually click the darn “Publish” button in stead of having your eye drawn towards it every so often. I did not expect to find myself staring at the screen, wondering what on earth to write about. And so far that has not happened. Quite the opposite. I have several drafts waiting as I write this post. They are awaiting further scrutiny, added links, a picture, or extensive editing. I have always had ideas pop into my head. The choice has always been either to jot them down at once, in which case I mostly found myself writing a lot more than just the initial thought, or not – in which case I would probably forget the idea or at least the contect which made the idea seem worth remembering. All my life I have written from scratch until I had two-thirds of the end result. After that I would add a few things, maybe move a few bits around, write the final version and call it ready. That worked for me at college, even though I might have done better if I’d bothered to remember the rules for writing essays. The only rule I stuck to – in fact, the only rule I could ever remember – was: you need an introduction and a conclusion. Based on that rule, I would start by quickly jotting down my obligatory introduction, then write myself a path into a glorious sunset, and wrap everything up in a famous last stand. And that saw me through to the very end, no problem. 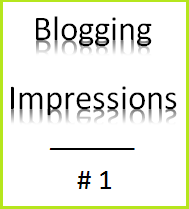 When it comes to blogging, I have learned a few things from my first five posts. A major issue is how to rein in my type-happy fingers! I guess I’ll have to pay attention to all the stuff I’ve read about better blogging. But now at least I have published something. I could have tried everything that bloggers were telling me to do in my first post and I probably would not have dared to point at the publishing button. As soon as I find myself looking at my Word count and thinking “Oops it’s well over 1k!” I’m going to find out which subjects to move over to another post. Maybe it’s a 3-post subject. If that is the case, fine. I’ll write three posts if I have that much to say about a subject. Plus I’m going to experiment with titles a bit. I write on stuff that is more or less related to the buzz around “content”, content marketing and other things but it’s really also a way to get writing about things I read and like. I’ve read blogs on how to create ‘eyeball-grabbing’ headlines but I don’t feel comfortable trying them. However there is no point in adding sharing buttons to a blog that has no shareable titles. This entry was posted in Blogging, Getting started, Writing and tagged blogging, obligatory introduction, writing by ContentRambler. Bookmark the permalink.